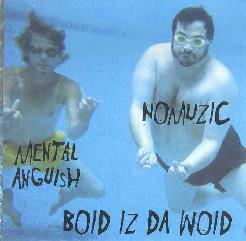 Mental Anguish + Nomuzic - "Tangled Up In Bush" / "Boid Iz Da Woid"
Chris "Mental Anguish" Phinney and Carl "Nomuzic" Howard are true veterans of the electronic music underground, having released seemingly countless recordings from numerous projects since the 1980's, and both have been key sources for distributing homemade music for a variety of artists. The two have collaborated on and off since the late 80's and here we have two of their most recent duo releases (see the Planet 0 reviews this issue for another project). 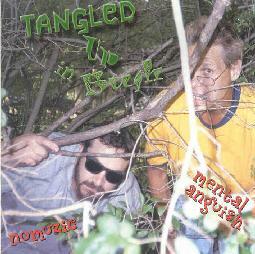 Recorded in 2001, Tangled Up In Bush features 6 tracks of space and sound journeys. On "Nuclear Powered Submareeen" the boys lay down a dark and intense rhythmic march that serves as the basis for their space and sound explorations. But this isn't floating space electronics that seek to lull the listener. The music is deep in space but follows a determined theme oriented path. Sure, they stretch out and explore. But the incessant march keeps us on a linear course as the space and percussive bits evolve and mutate around it. "Tower Of Power" is a space and drone piece with a wee bit of a jazzy vibe, once again propelled by a basic guiding percussion pattern. "Eeevil Rooolz" is one of the highlight tracks, particularly due to the more interesting and varied percussion, of course accompanied by fun and freaky electronics. And "Roood Tooolz Fer Croood Fooolz" might be my favorite of the set, having a rockin' dancey beat around which the alien electro orchestra do some of the most cosmic electro diddling this side of the Gamma Quadrant. "Kracca Mudda Fukkan" is a bit different, being more on the avant-garde side, though it's still loaded with oodles of strange and varied aural delights, including some nicely weird voice samples. And "Sweatin' Saturn Bullets" is another standout track, consisting of layers of atmospherics, swirly whirly UFO electronics, and voices from the spirit world. Unlike the more theme oriented tracks on the album, this is a parade of spaced out sound-art fun that morphs continually and seamlessly throughout its 12 minute length. Listen with headphones or you'll miss all the subtle bits rushing by. Recorded in 2002, Boid Iz Da Woid serves up 6 more tracks of similar music, making this an excellent companion disc to Tangled Up In Bush. "A-Tom-Ick" opens the set and reminds me a bit of Roood Tooolz Fer Croood Fooolz from the previous album, having a dancey space groove around which our heroes trip around the electronic cosmos, finding all sorts of weird and wonderful adventures along the way. "Befuddled Wakefulness" is part dark and menacing Goth rocker and part atmospheric space journey. But as it progresses the music starts to recall Bill Nelson's electro-pop days or songs from Peter Gabriel's third album, but with a marked space element. Lots of possibilities for vocals on this one. At nearly 17 minutes each, "Decadence" and "Labyrinth are pure, unfiltered space voyages, with no chemical additives, using only the finest all natural products direct from the infinite void. It's like Berlin circa 1970, but with Chris and Carl's unique perspective. Just strap yourself in, let your mind go, and these guys will do the rest. Mucho tasty! "Momentarily Disoriented" is a relatively short piece, consisting of spacey avant-garde collage sounds and textures. And "Crawling Sunlight" closes the set on a warped note, with off-kilter semi-tribal percussion, alien space electronics, distorted acid trip efx, and completely nutzoid voices that dominate the music, going on about... who knows what. Lovers of all things creatively weird will get a kick out of this one. Wow... now that was an enjoyable couple hours of listening and traveling outside my body. If you're unfamiliar with Chris and Carl's music then note that their combined catalogs could probably fill an entire record store. But these two little round things would make excellent starting points.